African dance can legitimately be considered the oldest form of choreography in the world. The dances are still taught to the children of the tribes from an early age, but the form has spread far beyond the continent to thrill audiences around the world. There are essential ways that African dance is different than most Western forms. The most obvious is the lack of partnered dancing (at least in male-female pairs). Instead, most of the dances are group performances separated by gender. The men dance for the women and vice versa, with all ages mingling or having their own dance. This helps reinforce the tribal roles, both in terms of the sexes and also in terms of a group identity. Another primary characteristic of African dance styles is the presence of drumming. With the exception of a few nomadic tribes such as the Masai, drumming is a rich and well-developed musical art form. However, it is also inextricably entwined with the art of dance; most African villages would never have drumming without dancing at the same time. A wide variety of instruments are used, from drums such as the djembe as well as other percussion instruments such as the shakera, a gourd with a net of tiny shells or stones loosely wrapped around it. Master drummers have to study and learn how to recreate the rhythms precisely, with no room for variation or improvisation until their art has been thoroughly absorbed. The musician's duty is far more than just entertainment, since the dances and music are seen as the glue that helps hold the tribe together. The drum beat reflects the mood of the tribe and the dance as well, and can vary depending on the purpose of each dance. The most common instrument used with the dances, though, is the human voice and body. Just as there are "talking drums" that change in pitch and tone, many African languages are "tonal," as described on the Djebefola Drum and Dance site. The entire tribe dances in some way or other, with even the children on their mothers' backs moving "in exact unison with the tune" (as noted by Bodwich, a nineteenth-century explorer). There are many different reasons for the various dances, all reflecting a part of life. This can be a simple work song to help make everyday tasks, such as washing or tending fields, more enjoyable, but the more complex dances are usually performed with some purpose in mind. The Agbekor is a dance often performed at cultural events and funerals. Celebrating the movements of warriors, the dancers stage mock fights with horsehair-tipped spears. This is one of the most popular and widely-seen African dances performed by contemporary troupes such as the Kulu Mele Ensemble from Philadelphia. The Nmane, on the other hand, is a dance of love coming from Ghana performed at weddings to honor the bride. There are many other dances from tribes such as the Yoruba which celebrate rites of passages as members of the tribe get older, as well as many dances tied to religious practices. Most African religions include the summoning and sometimes possession of spirits of various natural phenomena. The dancing, singing, and strong dance moves combine to evoke a powerful spiritual experience for those involved. One of the most striking parts of traditional African dance is the polyrhythmic nature of the movement. 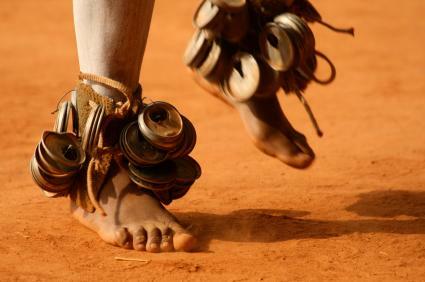 African dancers often are able to isolate particular parts of their body and move them to different parts of the rhythm, with two or three different beats going on simultaneously in the dancer's body. This fine motor control is often complemented by larger movements such as kicks, leaps, and wide and rapid swings of the arms. In the Adumu dance of the Masai, for example, the men show how high they can jump in the center of a circle while their fellow warriors encourage them. In contrast, the Mohobelo dance of the Sotho includes movements on all levels including writhing on the ground. While African dance is alive and well in the villages below the Sahara to the tip of Cape Horn, it has also been embraced by other cultures such as African-Americans in the U.S. and Canada. The KanKouran West African Dance Company was founded in 1983 in the District of Columbia and is one of many that helps spread understanding and enjoyment of African dance. Whether watching a breathtaking performance or taking the leap to learn at a workshop taught by a master teacher, there is something from the dance forms of Africa for anyone to enjoy.